Good-bye to this craftsman style, Chinese influenced, UNR gateway area house, neatly set up to move to another neighborhood, Reno’s Old Southwest. The university is putting a massive new Business Building in its place. Porthole windows and Chinese detail grace the building. But a piece is missing! 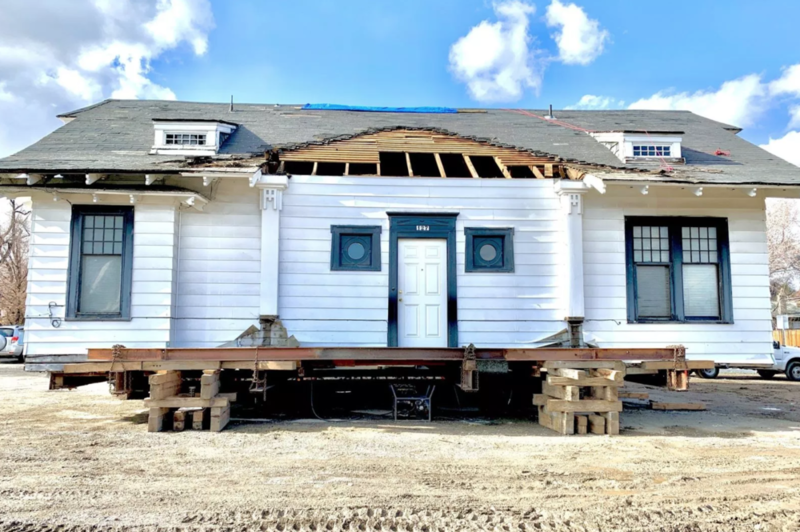 In pieces, the house will be able to get around town. Once, the house was part of a whole neighborhood of such houses leading up to the university’s entrance. Then, when the freeway was put in in order to take visitors right to the casinos’ doors, the house faced right onto the freeway. Prior to the houses, Native Americans from the Washoe tribe lived there. Soon, not craft but business will welcome visitors to the university. Traces of the past will be hard to find.